million dollar views. beach right out your door. swimming pool and hot tub. Beautiful Sandy Beach Literally just outside your Door at Bent Tree 101 North Shore Dr.
Weekly Saturday to Saturday Rentals Only! Not often does a condo of this caliber become a vacation rental for all to enjoy but now it has! The views are some of the very best in town and I am not kidding when I say that the private Bent Tree beach is right outside your door! 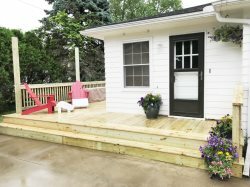 The outdoor spaces include a deck to the west facing the lake with outdoor dining and grilling as well as a deck on the northwest side for relaxing and taking in the breathtaking sunsets of the season. Inside there are 3 bedrooms and 2.5 baths with sleeping capacity of 9 allowed. The cozy sunken living room has a wood burning fireplace in case of a chilly night as well as a large flat screen TV. The experience is complete with a swim in the heated swimming pool and a good long soak in the hot tub! Bedroom 1. Second Level. Queen Bed. Master with En Suite Bath with Tub/Shower Combo. Bedroom 2. Second level. Queen Bed. Bedroom 3. Second Level. 2 Twin Trundles. Will Sleep 4. Bathroom 2. Second Level. Master En Suite with Tub/Shower Combo. Our family had a wonderful time staying in Bent Tree! It is not crowded at all. Beach and pool were great!